Acne is frustrating no matter what form it comes in. Whiteheads can be large and unsightly but blackheads can be downright frustrating. Small in size but ripe in numbers, they take up residence most frequently on your nose and chin and are a small reminder of how easily acne can sneak up on you. The term blackhead refers to discolored skin openings that result from a backup of skin debris. More specifically, when the hair follicle region becomes backed up with bacteria and sebum (oil) a blackhead is the result. In medical terms, they are called “open comedos”. Blackheads remain small in size because they form before too much bacteria can enter the open hair follicle. If more bacteria entered they would grow in size and become whiteheads; papules or pustules. Like other forms of more severe acne, blackheads can form because of hormonal changes and an increased production and buildup of oil. As the hidden bacteria is exposed to air and oxidizes it turns to that ugly black color. 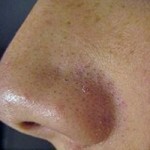 As I mentioned before, blackheads often form in or around the nose and chin. These are two regions that most commonly overproduce oil and the natural crevices are harder to keep clean. With that being said, there is a quick and easy blackhead treatment that you can try out right in your very own home for pennies per application. Introducing the Egg White Pore Strip! To make this quick and easy pore strip all you will need are the ingredients shown in the picture below. All you need to make these homemade pore strips are two eggs, a whisk and a bowl to mix them in plus two ply toilet paper, scissors to cut this to size and a brush to apply the egg white. Step 1: Using two small bowls crack your fresh eggs and separate the yolks from the whites. Step 2: Feel free to toss out your egg yolks or use them for cooking. 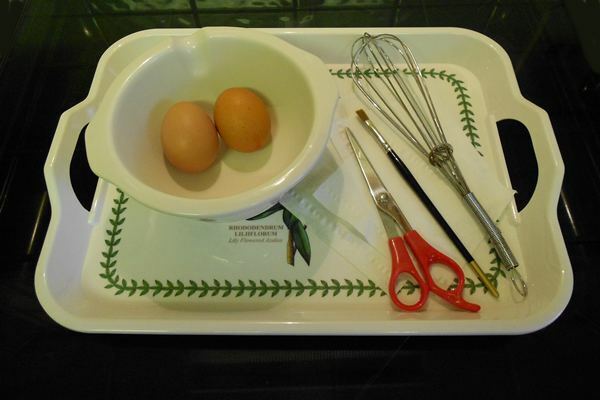 Focusing on your egg whites, whip them with a fork or whisk until they are nice and frothy. Step 3: Using a clean makeup brush (even a new paint brush or egg brush used for cooking will work) apply the egg whites over your blackhead-affected area. Step 4: Take your tissue and cover the area you painted with egg whites. Pat it down nice and good. Step 5: Over top of the tissue, brush on another layer of egg whites. Step 6: It may take anywhere between 10-20 minutes depending on how thick your egg white nose strip is, but allow it to dry all the way through. Otherwise it won’t be as effective. Step 7: Once your pore strip has completely dried- you will know because it begins to crack at the edges – gently peel from the outermost edges to the middle. Step 8: Give your face a gentle rinse with lukewarm water to remove any remaining egg off your face. Step 9: Pat dry and moisturize as usual. Editor’s note: If you are allergic to eggs, do not use this method. If you are in any doubt, try the treatment on the inside of the crook of your elbow – rather like doing a patch test before coloring your hair. If no adverse reaction occurs within 24 hours – go ahead and zap those blackheads! 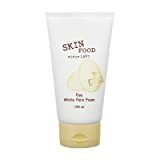 Buy Egg White Pore Cleansing Products Ready Made Too! 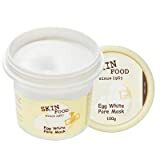 Egg White Pore Mask, Foam and a similar product to the home made pore strips above in the Peel Off pack (pictured right) – all products are from Skin Food. Egg whites are rich in vitamins and minerals like selenium which is great for preventing acne outbreaks. 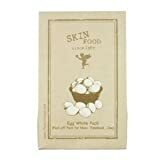 Also rich in proteins, this egg white pore strip reduces the signs of wrinkles and tightens pores. Besides being a great acne-fighter, the best part of this mask is how cheap it is. For about 50 cents a session you can afford to make this pore strip as often as needed! I have to say, Mother Nature sure does know how to make a cheap and effective acne treatment! But what about you? Do you have any tips on how to get rid of those pesky blackheads? If so, share them in the comment section below. Vanessa is a skincare writer who loves to write about anything and everything to do with skincare, especially acne! From reviews on products to handy DIY tips and tricks, such as how to make your own home acne treatments, she aims to help her readers look and feel their very best!